FIU and Royal Caribbean Cruises Ltd. will launch their new partnership, Royal@FIU, at the Royal Caribbean Production Studio at BBC on Friday. 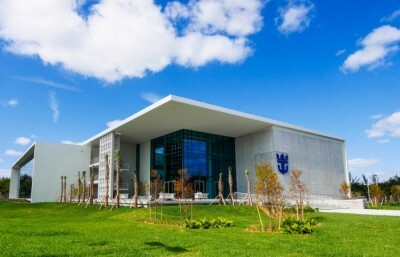 FIU and Royal Caribbean Cruises Ltd. (RCL) will unveil a 130,000-square-foot, state-of-the-art rehearsal and production studio on Friday and announce details of a new partnership that will include collaborative research, talent development and real-world experience for FIU students. The Royal@FIU World Stage Collaborative will create new opportunities for students in FIU’s Chaplin School of Hospitality and Tourism Management and the College of Architecture and the Arts (CARTA). These include paid internships, custom curricula and behind-the-scenes access to Royal Caribbean’s experts and facilities. Students will gain hands-on experience in cruise line operations, stage management, lighting, stage design, audio engineering and production. In addition, FIU faculty and staff will have access to RCL marketing and sales data from its six cruise brands to conduct original research and present findings to RCL. Located on FIU’s Biscayne Bay Campus, the production studio features three-story studios, a 300-seat theater, 20,000-square-foot costume-making facility, 10 rehearsal studios, a recording room and video editing facilities. The collaborative is an example of FIU’s efforts to create innovative public-private partnerships that bridge private industry with academia to promote talent development, research and economic vitality. A formal ribbon-cutting ceremony will take place from 10:15 a.m. to noon Friday at BBC. President Mark B. Rosenberg and RCL Chairman and CEO Richard D. Fain will speak.